element design that gives a highly collimated, clean Gaussian beam with low wavefront error and no diffraction. Adjustable focus allows the collimator to be tuned to any wavelength within the coating range and be locked down. This is very useful for many of the newer lasers at wavelengths for gas detection such as NH3, CH4, NO, H2O, CO and CO2. 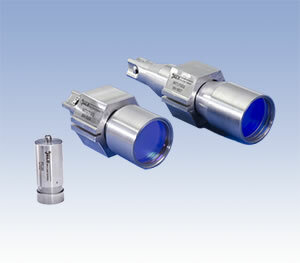 These adjustable collimators also allow you to focus the beam at some distance so that you can probe a distant sample with much higher power in a small spot. For Lab users we have an adaptor rings to mount the collimator onto any 1 inch or 2 inch optical mounts. FC40 and FC45 have a clamp style mount for mounting to platforms and tripods. For OEM users an adjustable collimator can be used for prototyping and then switched to a fixed unit. These collimators can be customized with fibers for this region, mounting requests, material or environmental requirements. Most fiber collimators are stocked for quick shipment. They can be customized for special environments, fiber types, mounting requirements, sizes or other requirements.